The countries of the New World prospered after World War II because they were never attacked on the continent. In this entry* we shall see how the United States began to feel a grassroots new cultural, social and political current brought about by the first postwar generation. The decade that in the United States is still remembered as simply "the Sixties" began with three symbolic starting points. In late August 1963, an African-American civil rights march on Washington was led by Martin Luther King, Jr. President Kennedy was assassinated in November. Then in February 1964, on the very widely watched Ed Sullivan Show, a group of long-haired English musicians called The Beatles played their electric guitars amid deafening cheering from teenage girls. 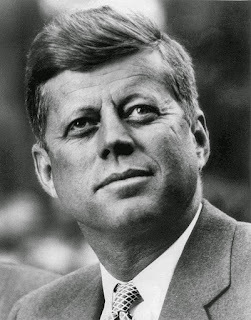 John F. Kennedy, for a time regarded as almost an informal saint and martyr (until his rampant sexuality became known), was said to have advocated reforms the "liberal" wing (in the U.S. and non-European sense) of the Democratic Party sought to carry. To "honor Kennedy's memory," Lyndon Johnson, a Southern political genius, succeeded getting a broad range of socio-economic legislation approved. Johnson also launched, the following year, when he won by a really overwhelming margin never seen again, the "War on Poverty. In less than 10 years, poverty was reduced from 19% to 11% (today it is 15%, to be explained later). LBJ also bequeathed a very broad socio-economic legislation, such as federal health insurance for the elderly and the poor, assistance for families and children in need, expansion of access to food stamps, subsidies for housing, etc. In economic terms, it was a moment of enormous prosperity. The average salary doubled between 1945 and 1965. African-Americans entered supervisory and professional occupations. By the end of 1970 women would join them (and soon surpass them). There was also new music, a Dionysian sound of rock-and-roll that broke with the apolitical restraint of earlier popular music. To rock was added the rediscovery of British and Irish folk music, and its traditional forms of popular protest. Popular music stopped being so much about romantic love as Joan Baez, Judy Collins, Joni Mitchell, Bob Dylan, Leonard Cohen and Peter, Paul and Mary, among others, sang about rights, peace, humanity and, as Che Guevara put it, a deeper love of people. The important topic of the era was freedom. Why more freedom? Looking back half a century later, I would say that prosperity made society more expansive and tolerant. There were protests (and I say this in the broad sense of the Latin protestare, which is "witnessing") of love, racial integration and peace. It all came from the conviction that the time had come to share prosperity, well-being, and happiness (often expressed as sexuality) as widely as possible. It began with the March in Washington singing "We Shall Overcome" reached its climax in Woodstock with the song of Country Joe & the Fish against the Vietnam war. I left the United States in 1961 and returned in 1970. I left a country that thought itself essentially white, Protestant, Anglo-Saxon and orderly, whose average people showed little interest in the rest of the world. I returned to a country where people drank French wine with their meals, had been in Europe or planned to do so even if it was backpacking, had experimented with some recreational drug, was open (in theory at least) to sexual variety and racial integration, and talked about breaking with conventions an awful lot. That was my generation, embedded in "the movement," which was a fuzzy mixture that had a hint of hippie, a bit of leftism and stylized anarchism, a general tendency to accept radical changes towards a new country where the important thing was to love a great love for all. We launched a cultural revolution that expanded job opportunity for African-Americans and other minority groups, such as Hispanics, and the oppressed majority, women. It was done through changes in the way of thinking, dressing and talking; and without violence. This was especially evident in what is now called the "second wave" of feminism, which began with the publication in 1970 of an anthology Sisterhood Is Powerful: An Anthology of Writings from the Women's Liberation Movement, the emergence of Ms. magazine and the song I Am Woman in 1973. Two words suddenly disappeared from everyday vocabulary: "boy" for black workers vanished overnight after the 1964, 1967 and 1968 riots, as did "girl," somewhat more slowly and reluctantly, for a woman. Finally, there is the question of attire and the length of men's hair. The consensus of all with whom I have talked about it is that until about 1968 the Beatles haircut was only for the musicians and a few adventurers who were the real hippies of 1967. However, by 1971 or 1972, even adults, like presidential candidate George McGovern, had at least sideburns and no male under the age of 30 had hair that did not reach at least the bottom of the neck. Adults, corporations and the de facto powers, that is, all those who felt threatened, opposed this amorphous movement. Unlike the worker-student coalitions in Europe, working-class whites resisted the changes, resentful of new competition in employment and housing from blacks, whom some of these workers still hated; for the white worker, racial prejudice was like coming home and kicking the dog in lieu of kicking the unassailable boss. There was a long history on the part of the wealthy of skillfully using ethnic hatreds to divide workers. Yet it takes taking a good look at those who opposed the youthful rebellion carefully to understand. Americans of the generation that had gone to fight in World War II and Korea, were shocked that their children chanted against going to Vietnam "Hell no, we will not go!" and even burned the stars and stripes. Those who married in church, had children and formed families now saw their offspring join in free love, which was possible first thanks to contraceptives then abortion, legalized in 1970. Older women felt mocked for being mere housewives without paid jobs or preofessions. That generation felt ridiculed for being "squares" and "useful idiots" of the "system." As a political force, all these people who longed for the United States from "before" ( the black and white of the 1950s) became invisible after Barry Goldwater's wipeout defeat in the 1964 presidential election, and were briefly appeased by Nixon's Vice-President Spiro Agnew, who coined the phrase "the silent majority," a mass that resurfaced politically for revenge in 1980. Notably, just as this era began with the unfinished presidency of Kennedy, it ended with another truncated presidency, Nixon's, which ended with his resignation in 1974 because of the Watergate scandal. * This is the third in a short series of posts that attempt to sketch contemporary U.S.cultural and social history. I intend to present how the time and place felt from a personal perspective, and only in the background, the history whose first draft appeared in the newspapers. All this comes from an exchange with a French correspondent that I thought might be of interest to readers of my Spanish blog. ** The Democratic Party was founded by Thomas Jefferson in 1792, while the Republican Party was launched in 1854 by Abraham Lincoln. U.S. political parties do not represent distinct ideologies, but interests and opinions, rather than theories. Since the Civil War, Republicans represented industrial anti-slave interests (it's cheaper to pay a wage and let the worker figure out how to provide for himself with it, than to assume life-long responsibility for a slave's housing, food and clothing, however meager). The South became staunchly Democrat because it was unpalatable for whites to vote for "Lincoln's party" (former slaves in the South were effectively denied the vote until the 1965 Voting Rights Act, which conservatives are currently trying to undo). In the 1930s, Franklin Delano Roosevelt, who was a personalist leader much like Argentina's Juan Perón or Brazil's Getulio Vargas, forged a unique coalition that comprised unions, white ethnics (meaning not of English origin) Blacks, liberals (including the tiny left and intellectuals) and Southerners for the historical reasons cited. This is how FDR became the only president elected four times (which led to a constitutional amendment, proposed by Republicans, to limit the presidency to two terms). That coalition was mortally wounded in the 1960s, as became clear in the 1970s and 1980s. The separation of church and state, written into the U.S. Constitution 200 years ago by Protestants who feared Rome as much as one another, had been the excuse for not having diplomatic relations with the Vatican State (relations that were established recently In 1983, under President Reagan, a Presbyterian who had been baptized Catholic). You must have lived it to understand it. The American Catholic world in 1960 was essentially a social castle, with walls of social protection for the 24% of U.S. inhabitants who professed the faith. It was an enclosed parallel society, governed by clerics (most of whom were of Irish origin and had their own fierce ethnic prejudices). That small country within a country, which had been carved from the 1840s when the Irish came massively fleeing the potato famine, had seen the addition of waves of later European Catholic immigrants: Poles, Italians, Germans, Czechs and several Slavs. A 1960s U.S. Catholic was seriously a Catholic. He went to Mass every Sunday, did not eat meat on Fridays and was part of huge families. He went to a Catholic school, whether parochial or private. If he was a worker, he joined a union in which his fellow Catholics were members with the active support of the clergy during strikes. The "lace curtain" Irish (except for the Kennedys), went to Catholic universities and from there entered Catholic law firms or Catholic brokers. Our typical U.S. Catholic man married a Catholic woman and had 6 to 12 children. He bought insurance from a Catholic agent and went to Catholic bankers. He never joined a number of associations because they were Protestant and neither he nor his wife ever considered sending their children to a public school. Catholics paid taxes for public schools and also supported a network of parochial schools that did not receive a cent from the government. On vacation they went to beaches where Catholics were welcome (often because hoteliers were Catholics). Oh, and since the Irishmen of New York and Chicago had built powerful local political machineries, being Catholic meant voting for pro-Catholic unions and the Democratic Party, not the Protestant, Republican, elite party. The vast majority of Catholics had been poor and working class until the GI Bill, which subsidized the university for the soldiers who served in World War II (thus generating the broad post-war professional middle class). The Irish came out of poverty by entering police work, then intelligence (there is even an inside joke in the CIA that the agency's abbreviation stands for "Catholics In Action"), local politics, trade unions, or the priesthood. Because they were the only natively English-speaking Catholic immigrants, the Irish became the ring leaders of all Catholic immigrants. The Italians (some of them) formed the Mafia, which originally was a set of independent self-protection groups (as they had been in Italy, when the Sicilians fought Italian annexation). The Poles were at the bottom of the social ladder, and were the target of prejudiced humor. There was for a time, from the 1880s at the end of World War I, a vibrant German Catholic community that supported its own bilingual German-English schools; this was destroyed by (a) the Irish clergy and (b) the war, when being of German origin was something that one hid. Most non-Catholics do not know this part of our history and therefore do not realize how enormous it was for Catholics to see one of their own nominated and elected president. To the Protestant majority, Kennedy was just an appealing young man (and how young man he seems to me now!) in a hurry to get things done. Listening President Kennedy's speeches once again after so many years, it is surprising to note how often he used the word "revolution" to describe nearly every proposal and challenge he posed. Yet, if one takes off his glasses of nostalgia, there is no doubt that he was a relatively conservative president. 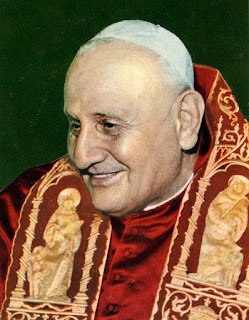 In fact, what was revolutionary about Kennedy and the other John of his time, Popr John XXIII, was the role they assumed just as social culture was shifting. They were both catalysts of a social and cultural revolution that seemed to start in the United States and, through the U.S. megaphone of Hollywood and popular music, in the world. For Catholics, Kennedy's election meant that the gilded doors of the famed American Dream had finally opened at all levels. In the 1960s, Americans of Irish descent rose in socioeconomic terms to the upper middle class. (In the United States the idea persists that we are all middle class, but we aren't.) Before 1960, Catholics were mostly non-professional, industrial and manual workers; after that, a very large proportion of Catholics became white collar workers and affluent. How brief a shining moment it was! One moment, as I recall, even the nuns at school seemed to be walking on a happy cloud in November of 1960; the next moment, they were crying, on another November, three years later. * This is the second in a short series of posts that attempt to sketch contemporary U.S.cultural and social history. I intend to present how the time and place felt from a personal perspective, and only in the background, the history whose first draft appeared in the newspapers. Although we are accustomed to think of our time in terms of decades, in terms of social consciousness decades don't match the decimal figure. The Sixties actually began in late 1963. Between 1958 and 1963 there was a "twist" of social consciousness, and in this entry in the series* I concentrate on 1958-60. The significant cosmetic touch of the time was the introduction of color television and Technicolor (somebody's trademark). The first televised presidential debate took place. Then came cars with extravagant fins and the beginnings of rock and roll. In some states the separation was carried out legally and ubiquitously. But in 1954, the Supreme Court ordered the desegregation of the schools; the armed forces, it should be noted, had desegregated by President Truman's order in 1946. There was a Civil Rights Act passed in 1958 that made some minor changes, but segregation continued. What did it mean, in practical terms, to separate people by the color of their skin? There were separate facilities everywhere: white bathrooms and black bathrooms; restaurants for one and another color; separate seats on buses and trams. This was not so obvious to me in New York, where that sort of segregation was just impractical and, after all, we were in the North. In New York, segregation was largely socioeconomic. African Americans were kept poor through discrimination in education and employment, in addition to housing. I saw apartheid-type segregation when we moved to Washington, which is south of the Mason-Dixon line, the cultural and legal divide that had once separated slave states and free states. In Washington, as in New York, there was socioeconomic separation. Whites lived in the best neighborhoods, with the best schools and got the best positions. In addition, I saw in the parks that there were water fountains marked "white" and next to them, other fountains, generally smaller and less well kept, for "colored" (as a child the word struck me as odd: white is a color and, strictly speaking, no one was really white). There were separate seats on the buses (but, interestingly, not on the streetcars). Taxi drivers, waiters and, in general, service staff, were black. The police were white, as were the bus drivers. I went to private Catholic schools (and to the French school a year), so I did not see black children in school. There was an amusement park, Glen Echo, to which I loved to go; only years later, when I returned from a long absence abroad, I learned that it had closed because it was segregated: it was a shock to realize I had never noticed there were no black children. I also saw another type of segregation. At a time when African nations were becoming independent and began to send their first diplomatic delegations to Washington, a hotel we initially stayed in denied them lodging. The Windsor Park Hotel which is now located in the Kalorama area is the annex building that the original hotel; it was quickly acquired to accommodate African diplomats. The main building eventually became the Chinese embassy and only this year was it demolished. Despite these problems, the civil rights movement began to pick up momentum in those years and there was a sense that the United States was willing to become a country with a bigger heart. At that moment came a young politician who symbolized breaking another kind of prejudice, John F. Kennedy. * This is the second of a short series of deliveries that attempt to sketch the contemporary U.S.cultural and social history. I intend to present how the time and place was felt from a personal perspective, and only in the background, the history whose first draft appeared in the newspapers. I see the 1950s in the United States in black and white, like television back then. The 1950s of the last century, already half a century away, form a time of cars with rounded chassis and adults wearing clothes that often seemed too large. Clothes that had few colors, or no more color than the average floral wallpaper. Insofar as I knew, men worked in offices. They wore hats, put on shirt and tie suits, some wore bow ties. They smoked. A pack of Parliament cigarettes evokes my father perfectly. Women stayed home taking care of the house and the children (me and my companions). American women did not make-up. But all the moms, American or foreign (like mine), made sure we believed that the world was made for children. We did not know it, but we were part of the U.S. baby boom generation, born between 1946 and 1964. Johnnies returned from war, got married, got scholarships to go to college, moved to the suburbs and, whatever else they did in their bedrooms, they scattered children everywhere. We, the boomers, were made to think that everything was possible. 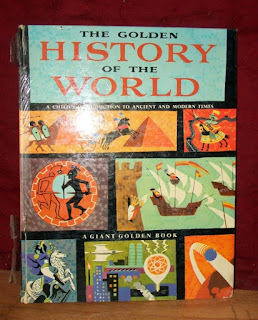 Among the artifacts I preserved from that time is my favorite childhood book for years, The Golden History of the World by Jane Werner Watson and Cornelius De Witt (published in 1955), subtitled "A Children's Introduction to Ancient and Modern Times". Golden was a children's books brand. "This is a fascinating world to grow in. In our time the magic of fairy tales has come true, we can fly through the air the most comfortably seated house we can turn the world in the time it took in another time to go Paris to London or Boston to New York.You can shop in India, South Africa or Japan and pay for goods by signing our name on a piece of paper we have brought.And in the shops of our own towns goods are brought For us from all countries of the world." It is definitely a world in which the child reader (I read it hundreds of times) could think that if there were pharaohs and Napoleons, and wars and miseries and everything in the past ... from here on, with me, a new story full of wonders begins. In that clean and orderly New York, the New York of John Cheever's early short stories, it was possible to think like this even as an adult. Or so I understood. It was a happy time for a president, Eisenhower, who had a baby face. He did not inspire much, but did not offend either. There was dissent, of course. There were the beat poets, such as Allen Ginsburg, whom my father said he met in a Bohemian bar in Greenwich Village. They were bearded people who said strange things, as incomprehensible to a child as to most ordinary people. There were also the forerunners of the 1960s music revolution. Elvis then, like the original rockers, Chuck Berry, Bill Haley and the Comets, and so forth. I only knew the classical music that both my parents listened to. Or the popular variety show music, Frank Sinatra, Dinah Shore and Perry Como. I also think of those times as the Cold War era. There was nothing more frightening than a Communist. Once, in kindergarten, on a day devoted to talking about the various jobs there were, the nun asked us "What do your Daddies do?" When I replied "Communist," the school called my mother, who after asking me what I was talking about realized I was confusing the Reds with what my father did. I had meant "economist". There were many other things in that childlike period in the United States, but I did not notice them. This is the first of a brief series of deliveries attempting to sketch the contemporary cultural and social history of the United States in my lifetime. It arises from an exchange with a correspondent in France, later a blog for my Spanish-speaking readers. I intend to present how time and place felt; the history whose first draft appeared in the newspapers will only appear in the background, as small details in a panorama shot, somewhere near the horizon. Upon turning 65, I am giving a backward look at U.S. sociocultural developments, or the "feel" of the times that I lived, which are now history. Not long ago, in my Spanish blog I wrote a series of entries on the U.S. in this period for my friends who are less familiar with what it's been like to be here. The next few entries will provide not merely a translation but an adaptation for the North American reader. Three things point to apocalypse in the near future. First, there is the world of my occupation, journalism (distinct from blogging). I have been reeling ever since May 31, when I heard that the New York Times Will Offer Employee Buyouts and Eliminate Public Editor Role. In my own less august journalism world, things have not been going according to plan either. This is the kind of gutting of the invisible people who make a well-written, well-researched news medium possible. It happened to The Washington Post several years ago and only the calamity of Trump was temporarily stayed the executioner. The Post was never the Times, but it could be a reliable source of information, sometimes written decently. I explained it in The Information-free Society. Second, my eye caught a business story in the Post, Why Apple is struggling to become an artificial-intelligence powerhouse, that made the Newtonian apple hit my head. AI explains the socioeconomic future! Third, there's climate change. No further explanation is needed. This may reflect the realization of my own personal apocalypse, as I approach my 65th birthday, but I honestly just don't see a better future.